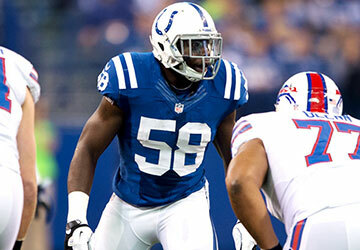 Fokou played for the Colts last season. Britts got a drinking buddy. Damn man. OK let's get on the phone with Tom Wort and see if that hammy's getting any better. Tell him that his release was just a misunderstanding. I'm sure he'll buy that one, right? This guy is a joke and a waste of time. He ain't worth dealing with. Cut this guy from the team. We can find better who can focus on playing football and winning games. Instead of a trouble maker. We had too many of these guy on the team once before. We are better then that. I think I read in NFL General this happened in January before we signed him? Apparently we didn't have knowledge of this beforehand. Dunno if anyone can confirm that though. This happened in January, before he signed with us. We knew about it. WTF?! If this happened back in January, why the Hell are they bringing it up now like it's something new? Is the media hurting THAT bad for news? What are they gonna put out next, Delanie Walker missed a car note payment or something? Wonder if the 9ers knew, thats why they let him walk? Also, Kenny Britt is back in NJ. Anyone wanna get a pre-thread going? The sad thing about this is that the more NFL players I see getting busted for DUI's these days the more I brush it off. It's pretty much a daily occurence in today's NFL and if this is his first offense I doubt much if anything will really come of it. I just don't understand why these fellas can't seem to call up a car service for themselves. I mean I would think that each team has a service that they tell their players to call if they had too much to drink. It's just unfortunate that it seems like every day there is something in the news about an NFL player getting popped with a DUI. It really just comes down to the players being able to make better decisions, because all of the resources for them to be safe and stay out of trouble are there.